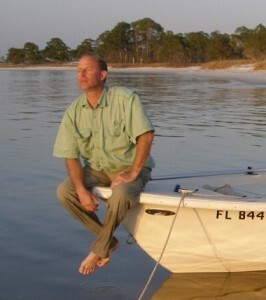 Cap’n Dave was born and raised (in, on, and under) the Chesapeake Bay of Virginia and the Outer B5anks of North Carolina, where his Dad taught him fishing, hunting, gardening… and the myriad skills of a self-reliant outdoorsman. He grew up loving all aspects of the outdoors, from geology to biology; from shooting sports to surfing, from backpacking to SCUBA diving (just to name a few.) In the early 80’s he became a SCUBA instructor and also a US Coast Guard certified Boat Captain. Moving to North Florida in the late ’80’,s Cap’n Dave began a 25-yr career in professional aviation, which included instructing; flying freight for the world’s largest Fed Ex Feeder airline; then corporate and executive flying; and finally flying the Governors of Florida on State Aircraft. Included in those years were stints with McDonnell Douglas and Boeing as an Instructional Designer and Educational Technologist…and a life-long love of exploring wilderness caves underwater. Cap’n Dave has earned Certified Permaculture Designer credentials from University of Florida Ag Extension; and is currently taking a refresher from Geoff Lawton and the Permaculture Research Institute. He currently practices these skills at his 6–acre Permaculture paradise near Tallahassee, Florida. The Federal Aviation Administration (FAA) is recognizing David Chandler Young with inclusion in the prestigious FAA Airmen Certification Database. The database, which appears on the agency’s website, names Young and other certified pilots who have met or exceeded the high educational, licensing and medical standards established by the FAA.